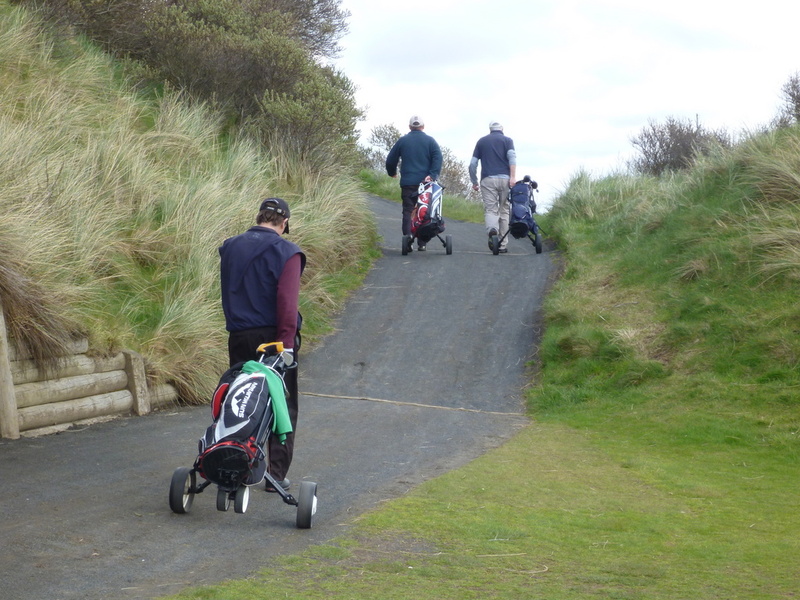 Trolleys, Portstewart Golf Club, Northern Ireland, April, 2012. 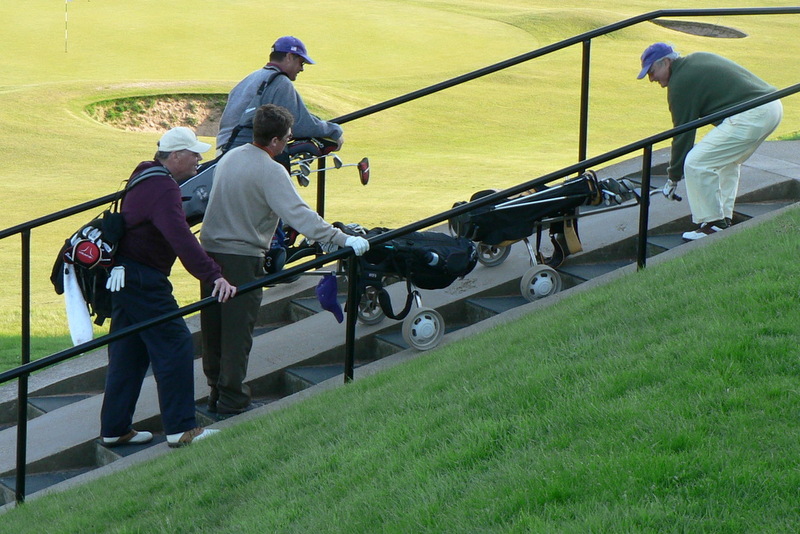 Trolley accident, Cruden Bay Golf Club, Scotland, 2008. 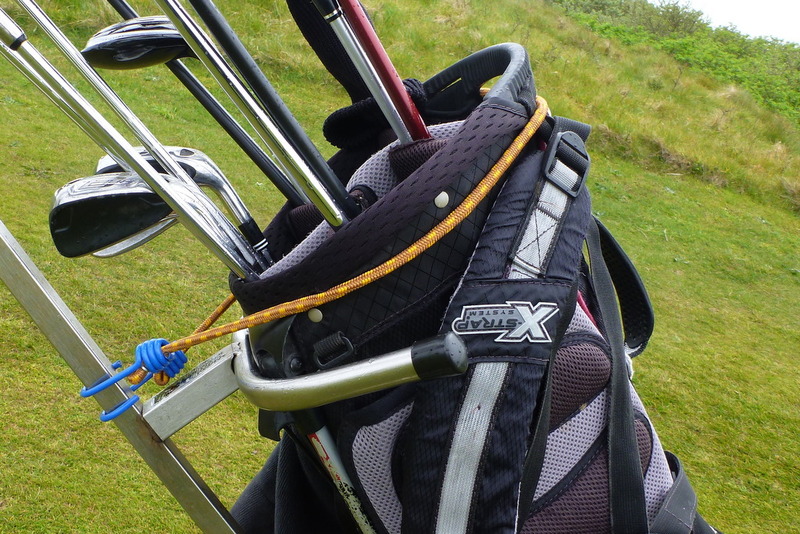 Golf bag secured to rental trolley with bungee cord, Enniscrone Golf Club, Ireland, April, 2012. I still overturn my trolley fairly often, but when I do my bag doesn’t usually fall completely off. The only time I got into serious trouble yesterday was as I was leaving the fourteenth green. I took a path that was meant not for trolleys but for mountain goats, and eventually had to pick up the trolley itself (with the bag securely attached) and carry it. This entry was posted in Accessories, Buddies Trips, Golf Courses, Ireland, Scotland by David Owen. Bookmark the permalink. David – Have you ever shared a packing list – what you bring and how you pack it – for one of your trips? Thx! This is going to be the subject of an upcoming Golf Digest column of mine, and I’ll elaborate in this blog. The short answer: less and less.